This trick must have been played many times at CVESD. 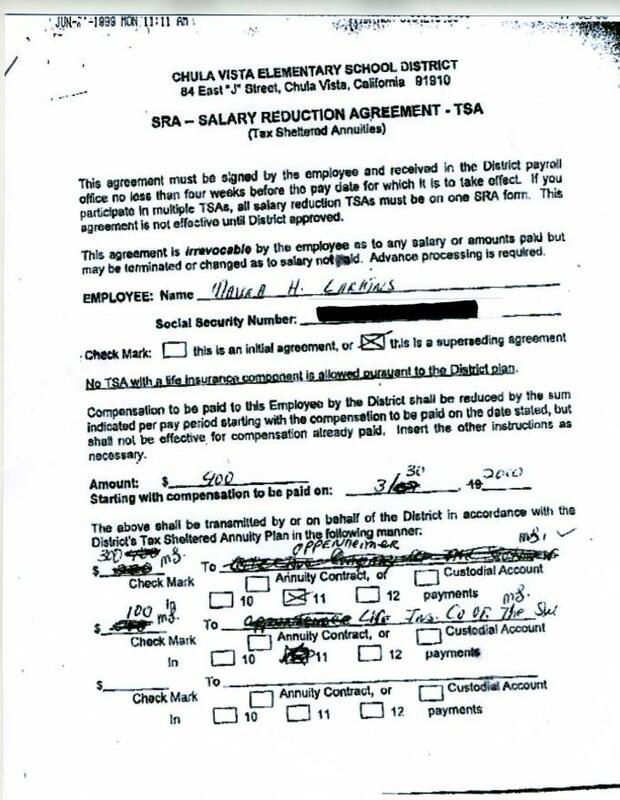 salary reduction agreement if you were Assistant Superintendent for Business Services? by CVESD and the teachers union to come into classrooms and give financial advice. Does Lowell Billings recognize hoaxes when he sees them? prepared the attached document on July 5, 2005, when I was NOT A JUDGMENT DEBTOR. I really would like to receive an answer, Lowell. It’s time for you to quit hiding behind your attorneys, allowing them to do wrong on behalf of CVESD. sometimes channeled through the Lincoln Club. school facilities for their own private business dealings? have an ulterior motive for authorizing access to teachers. I eventually discovered that money was being taken out of my paycheck without my approval. I asked Lowell Billings to provide me with a copy of the document that triggered the withdrawals. He refused to provide it. After repeated requests, he finally produced the document below. discovered exactly how much I had been losing. be locked up for years. as soon as I saw it. They insisted that I initial the cross out. claimed it was the only form they had with them. Well, it was pretty weird, but no wrongdoing had been committed yet. the South West" on the second line. the problems, I was ignored. Coronado instead of Pamela Smith in a school board election. schools had APIs above 800. “I found no sincere remorse,” U.S.
imposing punishment on Durham, 50. She said the former Fair Finance Co.
investors’ money, according to U.S.
Sanford and Pavia did to me. back in after they left my house. assistance by caring for children. law,” Lukacik said to the defendants.